industry through these whitepapers, eBooks, case studies, and YouTube videos. Despite the potential for increased efficiencies and cost-savings, less than half of all organizations use managed transportation solutions to handle their supply chain activities. 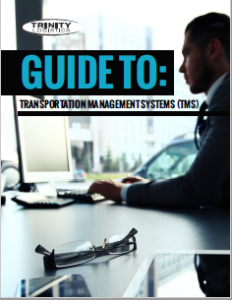 In this whitepaper, we debunk some of the common Transportation Management System (TMS) myths with a people-centric approach. A TMS (transportation management system) is a software platform designed to give shippers tools for control and visibility over their supply chains. With functionality and resources for all supply chain stakeholders, a TMS provides a single platform to manage all logistics events in the life cycle of an order, both inbound and outbound. This whitepaper is your ultimate guide to TMS, and how it can help you grow revenue, manage costs, mitigate risk, and gain efficiencies. It’s time to implement transportation process improvement strategies that lead to long-term cost savings. In order to supplement the effort towards these process improvements, a growing trend is to invest in transportation management software (TMS). In order to justify the investment in a TMS, transportation managers must present a detailed analysis of the return on investment (ROI) that a TMS can provide. Learn how to craft an ROI analysis in order to sell a TMS (transportation management software) to your upper-level management and C-suite executives. LTL (less-than-truckload) shipping is, arguably, one of the most confusing and complex areas when it comes to shipping freight. 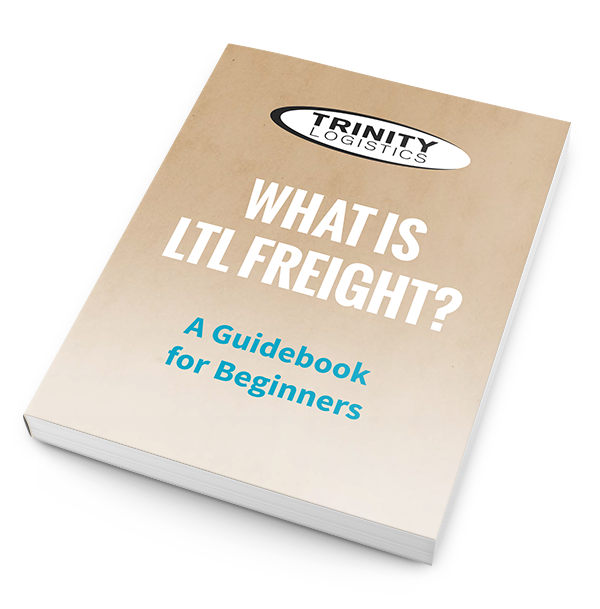 For a beginner, it can be overwhelming trying to learn all the ins and outs of LTL shipping – and some people don’t even know where to start! We recognized this common area of frustration and decided to publish a free guide for beginners. If you’re new to the transportation world, or are simply overwhelmed by all of the various terms used in the shipping process, we have just the thing for you. We’ve compiled all of the most commonly used terms and phrases and their definitions in one place to help make your life easier. 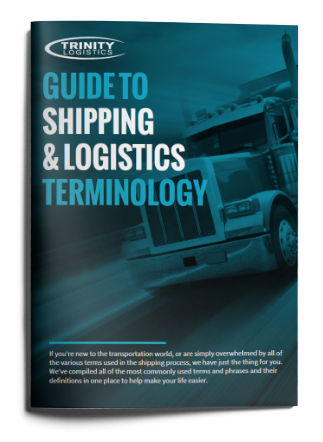 Download this guide today and brush up on your logistics terminology. 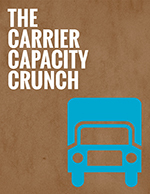 Are you a shipper who’s looking to get a better handle on what accessorial charges apply to your LTL shipments? We break down all the accessorial charges one can incur while doing LTL shipping, why fees are different between certain carriers, and how to ensure you get an accurate quote for your freight every time. Albaugh is an international leader in post-patent crop protection products that functions with a direct presence in key agricultural regions of the world. The company needed a Transportation Management System (TMS) that would integrate seamlessly with their ERP, eliminate the duplication of steps, and regain efficiencies and discovered Trinity’s people-centric solutions. Pompeian is a leading olive oil, vinegar, and gourmet cooking wine producer based out of Baltimore, Maryland. Pompeian was spending valuable time on manual data entry that provided little to no business analytics. Download the case study to learn how Trinity’s Transportation Management System helped Pompeian increase efficiency and reduce costs. TAJ Flooring is a global market share leader in high design luxury tile, plank, sheet, and loose lay flooring products. Their biggest national account had a large grouping of projects on the West Coast that potentially posed a problem regarding cost and lead time. Download the case study to learn how Trinity helped bridge the gap. 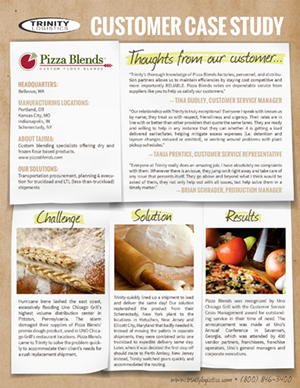 Pizza Blends is a manufacturer of flour-based pizza dough and other products. A supplier for UNO Chicago Grill, Pizza Blends found themselves in a sticky situation when Hurricane Irene hit the east coast and UNO needed product, fast! 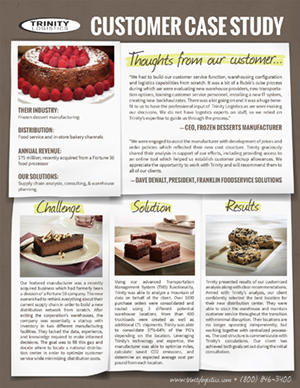 Download the case study to learn how Trinity saved the day and delivered the dough with our logistics outsourcing and freight shipping services. 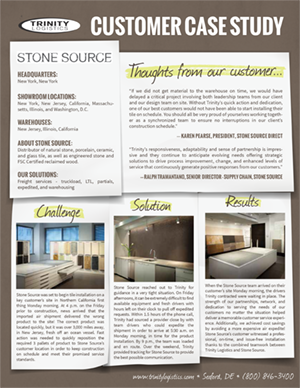 Stone Source is a distributor of high-end natural stone and glass tile, and they were all set to begin installation at a key customer’s site when the worst happened: the wrong product was delivered to the installation site. That’s when they turned to Trinity for help. Download the case study to learn how Trinity saved this important installation with our speedy service. 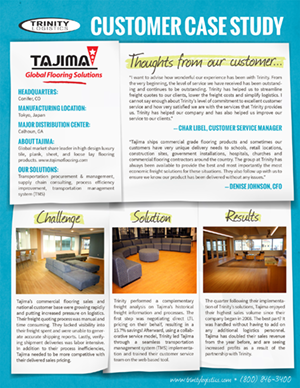 Tajima is a well-known floor manufacturer worldwide, and due to their rapid growth and success, they needed to revamp their supply chain and eliminate as many manual processes as possible. Our TMS (transportation management software) gave them just the visibility, automation, and control they needed. 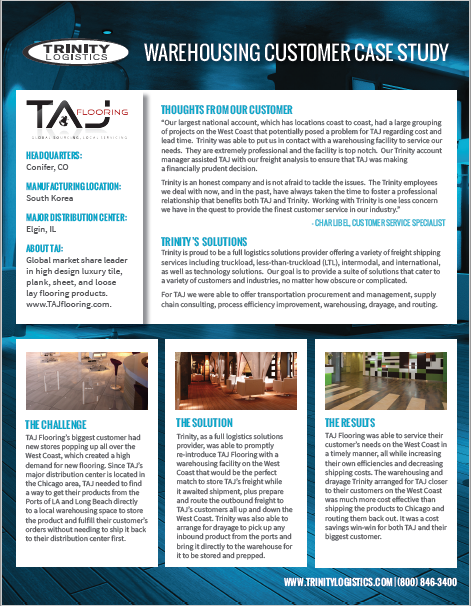 Download the case study to learn how Tajima was “floored” by Trinity’s service! This manufacturer, formerly a division of a Fortune 50 company, was acquired and essentially had to reinvent their supply chain from scratch. They turned to Trinity for help on where to establish their new warehouse location. Download the case study to learn how our consulting services resulted in a deliciously efficient warehousing solution for this frozen foods manufacturer. 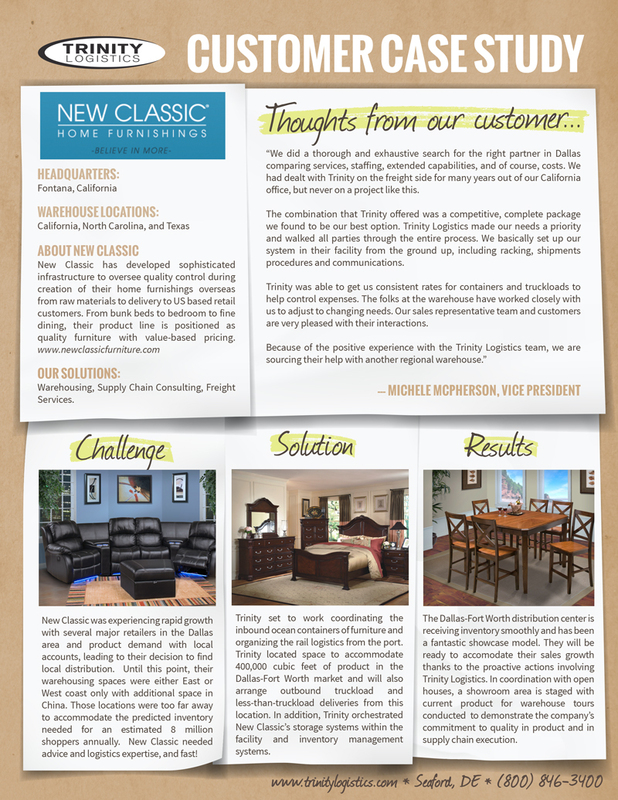 New Classic Furnishings, a quality home furniture company, was experiencing rapid growth with several major retailers in the Dallas area and product demand with local accounts. They found themselves in quite a rut since their only warehousing space was on the West and East Coast, and some options in China. Download the case study to learn how our third party logistics and warehousing solutions turned their local problem into an international success story.